It is a group of cancer that originates in the head and neck area and it affects the mouth, the nose, the sinuses, the throat, the larynx (voice box), and the saliva glands. Early detection of head and neck cancer in its early stages would save lives. Feel both sides of your neck and the area under the mandible (lower jaw) for any swelling or change in the symmetry of both sides. 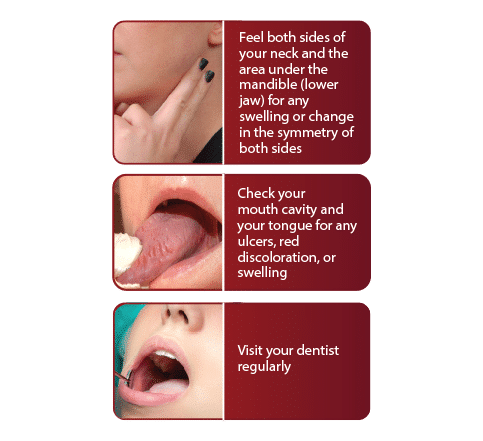 Check your mouth cavity and your tongue for any ulcers, red discoloration, or swelling.